Whether horizontally or vertically fix installed, used in mobile flown applications or on a speaker stand: The VISIO loudspeakers are real allrounders. 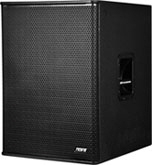 The NOVA VISIO series is a family of loudspeaker cabinets that do not only fit to each other. All VISIO cabinets are optimally tuned onto each other to insure an excellent acoustic harmony even in bigger sound systems. The loudspeakers with aluminium baskets, the high drivers with titanium membrans and the horns of fibre glass are especially developed for the VISIO series. All this insures a sound performance at the highest level. The most modern technologies in the field of frequency crossovers as well as safety circuits and processing make the VISIO loudspeakers to long-lasting top products. All VISIO cabinets include special front grills which are resistant against sports balls. This is an important advantage for the use in fixed installations. The VISIO cabinets are made from 15 mm birch plywood, covered with black NOVA PolyCoat©.